Welcome to my little shop on the internet. Come on in and browse to your heart's content. You will find many items to use in your beadwork, as embellishments or to embellish and turn into beautiful pieces of art. Be sure to visit my Beadwork Galleries to view some beautiful examples of how to use some of the items available in my catalog. The quantity available of each item is (1), unless otherwise indicated. Place your order promptly to avoid disappointment. New items will be added as they become available. Wonder Stones & Donuts - Semi-precious donuts in a variety of sizes; beautiful colors! Flowers & Feathers - flowers in three colors! 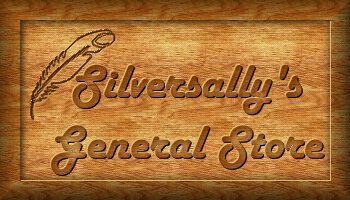 Ceramic & Special Items - A variety of unique and varied items. Feathers & Rings -Semi-precious feathers & rings. Shells - Large & small, with and without holes; interesting shapes, textures & colors! Spirit Slabs & Totem Rocks - Semi-precious slabs & interesting rocks, each engraved with an image! Cabachons - A small selection of semi-precious cabs in three sizes; Ceramic cabs in a variety of sizes and designs. Christmas Cabachons - Ceramic cabs with a Christmas theme. Blank Ceramic Cabs - Blank cabs are also available -- you must see the Teardrop! Bead Storage - Sets of round tin containers with clear plastic lids, available in a three sizes. The Beading Business Ring ?